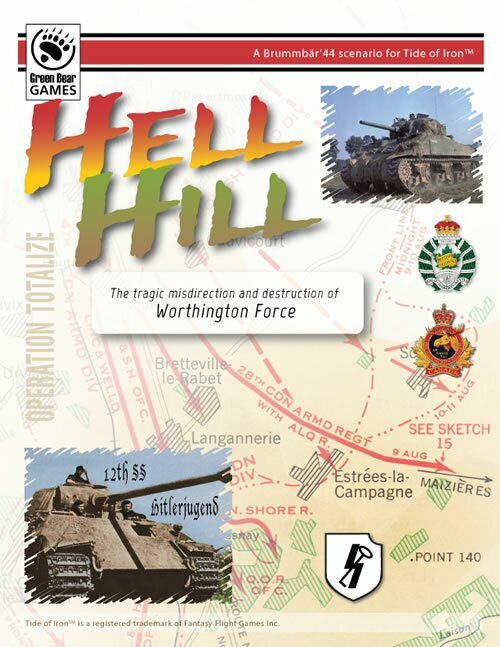 A new scenario for Tide of Iron, Worthington Force pits the wits of the Canadians who found themselves in the wrong place at the wrong time against an alarmed German force who moved quickly to destroy the force now in their midst. Worthington Force can be played with the standard Tide of Iron game. I couldn’t let a D-Day go by without sharing a battle with my friends. Tide of Iron scenario – Bridgehead Bretteville depicts the night attack on June 8th by the panthers of the 12th SS (with little infantry support) against the 3rd Canadian Infantry Division. The scenario was intended for a Normandy campaign publication that just never came to fruition (sadly). Maybe if enough of you out there want it…we can make it happen? Included is a stat card for the 6 pdr. gun and Panther that will be required for play. Enjoy. I know it’s been awhile since I’ve posted…summer was busy and I hope everyone had a good one. Now that autumn is setting in, I’m getting back into the games…well…sort of. I also had to move my server (so some things might not be working…getting to them). I did a Tide of Iron campaign that I hope to share more info about soon and of course, the Memoir ’44 Campaign Book #2 (which was actually earlier this year). I worked on the Pacific campaign and got to work directly with the man himself, Richard Borg. While all of the scenarios are of his creation, I got to stitch them together in the Island Hoppers campaign. Working with Richard was a dream, it was an absolute pleasure and honor! 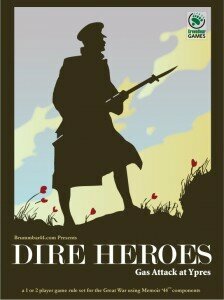 I’m sure it will be a great book for Memoir ’44 fans. Unfortunately, it appears that it will be my last effort with Days of Wonder. I was hoping they would publish my Hong Kong campaign (70th anniversary of the battle coming) but was told they won’t be able to get to it…too busy promoting someone else’s work I suppose. They also won’t let me commercially produce it, so I’ll likely release it for free around that time instead. It will be my last effort to that end. I have to admit, I’ve also really fallen out of love with M’44. I think the Online version had a lot to do with that. The dice seem so incredibly streaky and while I agree the percentages even out the game sure takes a turn for the worse when played that many times. As for their AI, it certainly gets better dice from the stats I’ve collected than us human players. But I digress…the Online really changed something about the game for me…that coupled with DoW’s reluctance to engage me will see my scenario designing efforts going elsewhere. I met some great people through the game and think the community is one of the best online, so I will miss you all. To be fair…I’ve also found another love. One that makes almost all of my board games seem rather flat. It’s one of the best WWII games I have ever played and have simply been engrossed with it for the last couple of weeks. If you are interested, have a look at Battle Academy…simply brilliant! Check out the demo. And it’s not a pay for play model (hint, hint). They have a great PBEM aspect so if you get it and want a game, look for me, Brummbar44 or drop me a line. I would be happy to play. This post couldn’t be complete without one more thing. 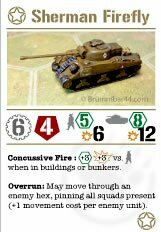 Here is a Breakthrough scenario for your enjoyment (make sure you use the breakthrough deck…it’s not the same without it) Memoir ’44 – Breakthrough Operation Totalize scenario. Update – Apr. 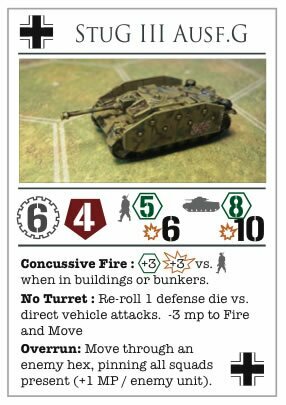 2011 : StuG III card now available. While I’ve been busy on a number of projects lately (Dire Heroes for Vassal, a Dire Heroes battles book, some scenarios for..well, you get the idea) I thought I would post an idea I had about the various vehicles that are available in Tide of Iron. I always felt that the manner in which they are presented on the player aid that comes with the game could stand out better. Here I show a wheel/gear for movement (first number) a shield to show armour, range and damage vs. infantry and range and damage vs. armour. This way, players can easily see the stat they are looking for at a glance. The cards are double sided with a bit of historical information on the back along with an optional rule that players can decide to play with or without (if both agree…all optional rules are in effect). While these example cards are for units already in existence, the idea here is to add cards that don’t currently have official rules. I’ve kept these cards printer ink friendly.